I was captivated by this video, posted to Facebook by a friend with whom I started college many years ago as a music major. My friend went on to become a successful composer and music professor while my life took a few different turns. 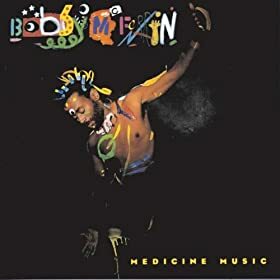 But both of us have an enormous respect for one of the genius musicians of our time, Bobby McFerrin. I was an instant fan. The music was enchanting. This wouldn’t have been extraordinary except that, because I was sick with a chronic illness that impairs the brain, I couldn’t comprehend music at the time. I’d been a serious amateur musician for decades, had played and sung local gigs in Oakland, where I lived, but once I came down with that illness I lost, for periods of time, any ability to follow a musical piece or understand its structure. Very few kinds of music could speak to me at all. I remember that an album of Vivaldi cello concertos seemed to soothe my disordered mind. And Medicine Music. I stuck the cassette in my little player on top of the fridge and played it immediately. The next morning at breakfast I played it again. And the morning after that. I played that tape every morning. For a year. I kid you not. I have never, before or since, listened to a single album so often. McFerrin’s music truly became healing music, accompanying me through long months of recovery. (The illness lasted four years in all and has been over, thankfully, for fifteen years.) Now that neuroscientists are exploring music and the brain, it comes as no surprise to learn that music trains our brain waves into smoother, more harmonious states—or riles them up, depending on the rhythm and timbre of the music. McFerrin and his Voicestra in the early nineties were taking music down paths no one had yet explored. They riffed as a group to blues or jazz or classical prompts, every piece an exciting, one-time-only creation. And every New Year’s Eve, for a few years, they took over Grace Cathedral in San Francisco, singing out the old and singing in the new with local musicians in group improvs that were sometimes breathtaking. I hung out with them for a couple of those nights and will always remember dancing and singing down the aisles at three in the morning while a Voicestra member led an impromptu gospel-music chorus. Then, when my two-hour singing shift was over, I lay on a pew and drifted in and out of sleep, the voices of angels carrying the music forward into dawn. Wonderful, wonderful. Thanks for adding an uplifting, smiling moment to my day! P.S. I meant to say, ANOTHER uplifting, smiling moment! Love this piece. Thanks, Sandy, glad you enjoyed it!